by Fred Aprim, author and historian, California, U.S.A.
Mandeaen priest baptizing in the name of John the Baptist The Mandaeans are sometimes referred to as Sabaeans, but one must not confuse them with the Sabaeans of the early Yemen history, in the southwestern edge of the Arabian Peninsula. Mandaeans during Islam acquired a dhimmi status just like the Christians and the Jews, and were classified by Moslems as a "protected" sect. 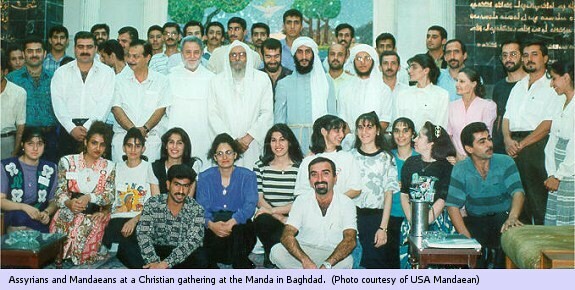 Traditionally though when a Mandaean family converts to any other religion, although not abandoning its ethnic identity, it no longer is considered Mandaean. For the Mandaeans, Sunday is considered a holy day, which they call habšaba (habshaba). The ceremony practiced on Sunday could last almost all morning. Mandaeans or "Saint John Christians", as they are called sometimes, believe in God and His Monotheism. God is called in their holy book and other religious sources, "The Great Life or The Eternal Life". Also, they believe that Adam was their first prophet and teacher. Their second prophet was Sheet who is named "Shetel" in Mandaiac; followed by Sam son of Noah. Aspects of the Mandaean Religion include: Monotheism; Baptism; Praying; Fasting and Giving (moral and material). Within the community of believers, who are known as the laupa, there are those who are not priests but know how to read and write classical Mandaean language and are called ialupia "cultured secular layman". They have access to the sacred texts and the knowledge those texts convey. Above the priests are the ganzibria (singular ganzibra) meaning "bishop", a name connected to ginza "treasury," which could mean also "the treasurer of knowledge." Heading the religious hierarchy was a riš (rish) ama "head of the people" but this position has not been filled since the 19th century, which few many describe as a sign for a declining of Mandaeanism. The oldest Mandaean liturgical text is a set of collection of Hymns of Praise called Qulasta. Other parts of the text are Sidra d-Nišmata "The Book of Souls", containing liturgies for the maSsbuta (plural maSsbutiata) "solemn baptism"; prayers for the masiqta "elevation, a ceremony to help the soul"; Asut Malkia "The Greeting to the King"; Rahmia (everyday prayers); Abahatan Qadmaiia "Our First Fathers"; prayers for weddings; drapša "ceremonial standard with a support in the form of a cross"; zidqa brika "blessed offerings"; klila "crown of myrtle", and so forth. Other texts include Sidra Rba "Great Book" or Ginza "Treasurer" iamina (of the right) and smala (of the left). In addition, in Mandaic a large number of magic texts have been redacted.